WAX stands for “Worldwide Assets Exchange”. In brief, it’s a decentralized platform for trading virtual items. This is a $50 billion industry, with more than 400 million users worldwide. The vision is to “allow gamers to trade whenever, wherever, peer-to-peer”. 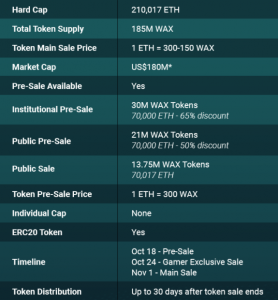 The WAX ICO will take place on November 1st. The founding team behind WAX has previously launched Opskins – “the #1 virtual goods marketplace for online video games”. The key members of the team include William Quigley (CEO), John Brechisci, Jr. (Lead Designer), Jonathan Yantis (COO) and Malcolm CasSelle (President). Among their advisors, we have seasoned executives from the gaming industry, including Dave Anthony (Call of Duty), Ken Cron (World of Warcraft), and Brian Fargo (Interplay). In addition, they have some heavy hitters from the blockchain world: Anthony Di Iorio (Jaxx, Ethereum) and Michael Terpin (Transform Group). It’s worth mentioning that WAX has already announced a partnership with Kyber Network. In this partnership, Kyber will serve as the decentralized exchange layer, enabling buyers to purchase virtual game items using ERC20 tokens seamlessly and securely. Similarly, as WAX token will act as the sole method of payment for its ecosystem, Kyber Network’s integration will expose interested parties to the platform. You can read more about the partnership here. One interesting aspect of the collaboration between Kyber Network and WAX is that they both have huge communities – as can be seen in our Telegram Tracker. How can I participate in the WAX ICO? As you can see in the details above, there has already been a significant pre-sale with a generous discount. This is worth keeping in mind if you’re considering participating in the WAX ICO. People who participated in the Kyber Network ICO are also eligible for a 3% discount.